The May 7, 2014 story was published the day before a hearing to determine whether or not Mary would be released from prison. For reasons of discretion the entirety of the interview was not printed. Why give the government anything to use against her in the hearing the next day? This led to some confusion about the nature of what actually happened in Mary’s case, and we received a number of emails about some of those issues. Had we decided to publish the interview in its entirety, the confusion would have been kept to a minimum. The questions we received ranged from the nature of the gun charge that kept her in jail for nearly a year, to why she entered a guilty plea regarding the charge of impersonation of a government official if she wasn’t guilty. We didn’t disclose any more details in response to those questions but always wanted to because we felt that the story was incomplete without them. Mary has now appealed her sentence. As part of that appeal a number of documents have become publicly accessible. Within those documents are a number of details that Mary revealed in her interview but which, out of deference and discretion, we previously omitted. The omitted details touch on the nature of the plea-bargain system Mary was subject to. They also touch on the veracity and truthfulness of the story told to the government that led to her current incarceration. In the lay opinion of these writers, Mary was railroaded. Here we present sufficient facts for readers to come to their own determinations. It is important for people to know the travails of those who, like Mary, fight back against fraud and corruption, so the people can appreciate the full magnitude of not only Mary’s courage (and those like her), but also of the enormity of the problem. 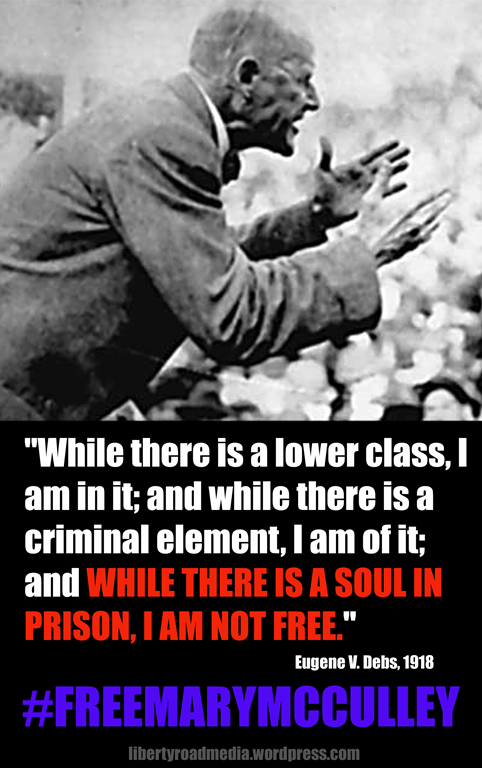 It is important for them to know this so that: 1) they know they are not alone in this fight should they choose to engage; 2) they know they’re not crazy—the fraud they’re witness to is not imaginary, 3) and they can be aware how far the system may go to deprive them of their liberty and property. Below are selections from publicly accessible documents in Mary’s appeal. Minimal commentary is included. So why did she plead guilty if she wasn’t guilty? Q (attorney Ashley) And you previously appeared before this Court and pleaded to impersonating a federal employee; is that correct? A (Mary) I believe an employee of the government is what the terms were, yes. Q And it is your position that you were somehow coerced into that plea; is that correct? A Verbatim, what was said to me was that if I didn’t take a plea deal, I was not going to be able to take US Bank to trial. A Whether that’s coercion or intimidation, I don’t really know the terminology, but they made it very, very clear. And the importance of taking the bank to trial, as evidenced by these findings of fact, was not about the money. When Mr. Racicot talked about my bizarre behavior, which I’m assuming was in 2012, when I was in the civil litigation, what I witnessed was officers of the court fabricating evidence, making false statements to the judge, affidavits from senior vice-presidents of the banks that were false, and this was a very, very difficult thing for me to comprehend, not being a lawyer, not understanding that. And it was very, very disturbing. Q — you did tell this Court that you impersonated a federal employee? A I impers- — I made up the name of the company. I was honest about that, DICS. I never used the word “federal,” I never said “United States,” and I did not use the word “government,” and there’s no such company. Q Okay. But in any event, at that point, did you tell the Court that you were concerned about doing what you were doing? A I believe I made a statement in September when the hearing was vacated that it was very important for me to take the bank to trial, and I believe, when the judge asked me if there was a side deal, I made a comment about going to trial with the bank. So at that point, I didn’t have a choice. I mean, it was very clear to me: “Take a plea deal, or you’re not going to go to trial with the bank.” So that’s what I did. Q — to the civil case going to trial in Bozeman; is that correct? Q Okay. And you’re basically telling the Court now that there was newly discovered evidence, or at least in your opinion newly discovered evidence, from the civil case that would somehow alleviate your situation here; is that correct? A Yes. In my opinion, the government was misled, and if they reviewed the findings of fact by Judge Brown [LRM NOTE: Judge Brown presided over McCulley’s suit against US Bank in which a jury awarded her $6 million in damages] and the mentions of the closing 11 times where a lot of the documents were forged, altered, copied, those are the witnesses in this case. A — and I feel like, yeah, yes, it does shed new light. It’s new evidence and proof. “In or around June 2013, I was indicted on several charges stemming from a civil law suit that I filed against the witnesses in 2009. I pled not guilty to the charges because I am not guilty. The indictment came just months after I won my appeal against US BANK, and the Montana Supreme court remanded the case back for trial. I explained to my court appointed lawyer that the witnesses were not being truthful, and in fact were involved in the mortgage fraud that was slated for trial Feb 3, 2014. I explained that I believed they instituted this malicious prosecution to derail my lawsuit against them. My attorney stated this was not a defense, that he did not believe me, and said that if I did not take a plea deal, I would not be able to take the bank to trial for the fraud. So what about the gun charge? 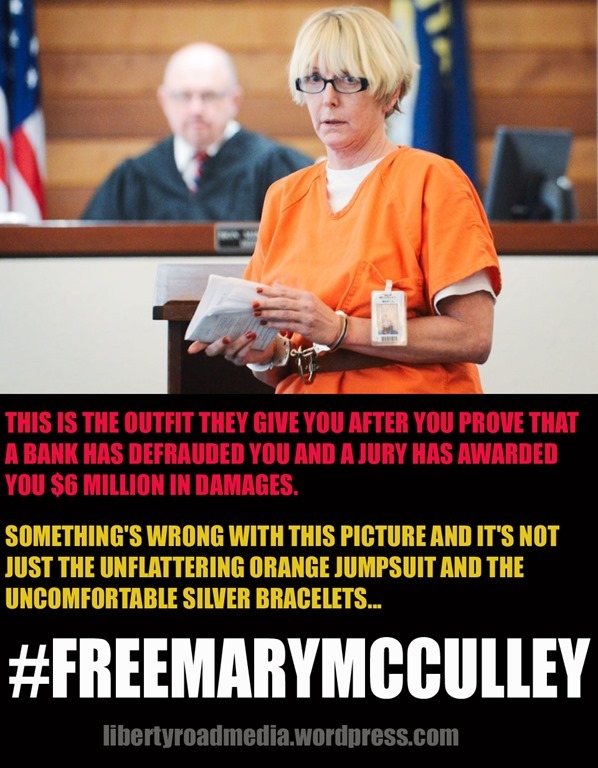 “My name is Mary Ann Mcculley, I am currently incarcerated in SFF Hazelton, Bruceton Mills, West Virginia. I am making this declaration under penalty of perjury, all of these statements are true to the best of my knowledge. 1) April 25, 2012, I was arrested and charged with assault with a weapon, a felony. would be an accidental concealed weapon violation. 3) The facts showed that I had left a 22 caliber birdshot pistol in an overcoat. 4) I was interrogated by Detective Ferguson for hours, I asked for an attorney 6 times, and they ignored my request. They failed to read me my rights before throwing me in a high security cell. 5) The affidavit of probable cause, and the reports filed by the police stated I had slammed down some papers, and said ‘This is my final offer you will sign’ and alternately ‘This is the last paper you will ever sign,’ and then pulled a gun and pointed a gun on the witnesses. This later proved to be false. 6)I was represented by a public defender, Chris Petaja. 7)I was held on a million dollar bail, despite not being a flight risk and being indigent.At the time, my civil lawsuit against the witnesses was due on appeal at the Montana Supreme Court. I was pro-se. 8)The witnesses against me were the defendants in the civil fraud case, Mcculley v US Bank and American Land Title Company. These are some of the same witnesses against me in these recent charges [LRM NOTE: i.e., the impersonation charges]. 9)The DVD of the Witness interviews, given to us by the prosecution was blank. It was six months before a DVD of the witness interviews was provided to us. 10) Upon review of the witness interviews, taped by the police officers immediately after the incident, it was discovered that the statements made by the police on the affidavit were false. There were no demands, no threats and no witness said that I had pulled a gun or pointed a gun at anyone. In fact, they specifically said I DID NOT threaten anyone and did not point a gun at anyone. 11)Subsequently, my attorney filed a motion for a Franks hearing, and a motion to dismiss the assault with a weapon charges, arguing the affidavit was fourth level hearsay and the charge arguably should have been a concealed violation. 12)The State conceded the information on the affidavit was false, the judge denied us the right to question the police officers, who had been subpoenaed- and I was rearranged with a new version of the story, after being held for nine months at this point on a million dollar bail. 13) During my incarceration, I managed to file my appeal against US Bank and American Land Title Company, hoping to overturn the summary judgment rendered by Judge Brown of Gallatin County. 14)I went to trial for the Assault with a Weapon charge in Feb. 2013, and was found not guilty of the weapon charge. I was released after serving nearly twice the maximum time for a misdemeanor assault. 15) In April 2013, against all odds, the Montana Supreme Court reversed and remanded that US Bank stand trial for fraud. I was indicted on these new charges within months of winning my appeal. 16) It is undisputed that one of the Governments witness was the manager of American Land Title Company where most, if not all of the fraudulent documents were signed and/or altered. According to discovery produced by one of the witnesses for the Government, the lawyer for the title company, the government witness was the one who altered the $735,000 Deed of Trust after I had left the closing, and was acting as an agent for the bank. 17) At all times these witnesses lied to the government and had motive to lie. US Bank was found guilty of actual and constructive fraud in February 2014. There is no question as to the participation of the government witnesses in the fraud and I gave the court these exhibits and documents on Feb 18 2014, when I testified and hoped to withdraw my plea. 18) Because the police filed the false information regarding the gun story on the arresting documents, and conceded doing so, I filed a lawsuit against them in Federal Court just prior to sentencing on April 25, 2014, alleging libel, slander, and intentional infliction of emotional distress etc 1983. The story, fabricated by these officers, was published from Seattle to Washington DC via the AP newswire. 19)This fictional version of events of April 2012 made it into the PSI. I objected and provided my attorney Michael Donohoe with the witness interviews and files from the district case to prove it was false. Donohoe, however, failed to correct the PSI – or properly object to the damaging false information. 20)This story, admittedly made up by the Bozeman police named in the lawsuit, was used by Judge Haddon in sentencing me with the upward departure. In fact, he read this story in the May 8 hearing, as if it was true and factual when it is actually complete fiction. 21)I had also repeatedly begged Mayo Ashley to correct the PSI and also provided him with the info needed to prove the story was false, but he said that ‘ no one pays much attention the the PSR’ and he did not file the objections. 23) The court received numerous letters acknowledging who I am in support of me , which the Judge ignored. 24) I moved home to be my mothers primary caretaker in 2010. My mother is 82 and in very poor health. Despite plenty of evidence that I am her primary caregiver, including regular visits from my pre trial probation officer, Judge Haddon claimed he had no evidence that was the truth. 25) I believe that I have more than served my time for an act of carelessness in 2012, ten months for an accidental concealed violation that had a maximum sentence of 6 months. To use this mistake to label me as ‘dangerous’ is not proper. “She suffers from PTSD and is sitting in a medium security prison in Hazelton although, she herself, was never charged with a violent crime. In fact, she has no other prior criminal history other than the related state criminal proceeding where she was found not guilty for the charge of assault with a deadly weapon (the only other violent criminal charge she has ever had). She was merely a photographer fighting bank fraud in pro per in a Montana civil court where she eventually won $1 million in actual damages for fraud plus punitive damages for the bank’s bad behavior that included, lying to the tribunal. Now how can the federal government rely on the statements by those same people in asserting their prosecution (of a purported crime that is rarely ever prosecuted and never prosecuted when there is no financial gain in reality, especially when it is reported on the eve of civil mediation by the opposing party who feigns the belief that the company D.I.C.S. is a federal agency of the FBI that he believed Ms. McCulley worked for–even though she had deposed that same man seven (7) months previously). Then the USDOJ prosecuting the case, is not just any USDOJ, but the governor’s son. So in sum, this Court would have to come to the conclusion that a local ex-cop’s son (Tom Cahill) and the governor’s son (USDOJ Racicott) both had the reason to believe that Ms. McCulley impersonated a FBI agent to Tom Cahill because she walked up to him the day before their mediation and said she worked for a company called DICS. So that leads to the reasonable conclusion, she must be an employee of the FBI and is falsely impersonating one. This is what the people’s federal taxes are paying for? Then in February it was proven that Tom Cahill is the same person who actually assisted in committing the fraud by changing the terms on the loan documents and/or land records. Yet, the USDOJ still does not dismiss the case even though the complaint was brought solely on the witness statement of Tom Cahill and his wife. There was no other independent evidence. Being thrown in prison in order to try to stop a person from continuing their civil suit for fraud, after being told they had to plead to one count or else they would not get their case to civil trial, is irreparable harm. It not only harms Ms. McCulley, but it also harms the federal government, the overcrowding of the BOP, and the people. It is our hope the information presented here will help garner more support for Mary in the minds of the public and help create a groundswell of outrage against her incarceration leading to her release, and to righting the wrongs committed against her. From our own cases we know the filing of these types of motions, pleadings, and other papers feel like screaming pointlessly into a void. Does anyone even read them? Let’s all help assure that Mary isn’t screaming pointlessly into a void…and make sure she can catch a train straight back to the outside! This entry was posted in Conspiracy, Everything Is Rigged, Foreclosure fraud, Mary McCulley, Uncategorized and tagged 9th Circuit, actual fraud, American Land Title Company, assault with a weapon, constructive fraud, Court of Appeals, FBI, fraud, Hazelton, impersonation, interview, Judge Brown, Judge Haddon, Lenore Albert, Mary McCulley, misdemeanor, Paul Harvey, punitive damages, stay of sentence, Supreme Court of Montana, Tom Cahill, us bank, West Virgina. Bookmark the permalink. Excellent account. As you know I know Mary personally, and she called me the day she learned of the indictment. I am also fighting US Bank and have been for nearly 6 years. Not only that — someone was logged into Mary’s computer that day from Reston, VA even though Mary is in KY. The FBI is in VA. It so happens on the Mary called me someone broke into my car, yet took nothing. They left it open so I would know. They stole a dog house from my front yard. They sent a power surge through my house, frying one of my computers. They went into my YouTube video about US Bank (at http://www.RaglandvUSBank.com) and not only wrote vile comments I saw them present in another US Bank case fake email–but they worded them in a way I tell me they knew something about me. I went right on Facebook and told people and they buried their vile comments. But how can that be a coincidence all that happening at once? Mary and I were aware out conversations were being listened to by the FBI, and our emails were being read. I have been warned to keep my nose clean so I don’t end up in jail. And just the other day someone went on Facebook and declared I was under investigation for murder which is ludicrous. I have seen US Bank take someone’s guns who simply asked to see her original loan file. I attended that hearing with the full intent to testify for her. Then suddenly out of the blue with no letters or warning my money was frozen in a bogus tax lien, for a ‘missing’ tax return from 2007 in 2013–which they later admitted they had. Friends we have moved past defending all this foreclosure fraud with the law, to using Gestapo tactics. Anyone who actually believes Mary deserves to be in jail for something the US attorneys office says don’t even prosecute and is not actually a crime — and in maximum security no less– is blind to the truth. Oh PSI is the presentencing report where Cahill changed his story to say Mary said she was FBI, when his initial interview never said that and she denies it. But he’s already a proven liar swapping his loan, so he’s credible, right? I would love to say; This doesn’t happen in America!, BUT, I would be lying, to myself and anyone who has been dealing in FRAUDCLOSUREs or worked with any local school, town, county or state boards. When something is volatile, and many uppity entitled entities are envolved, you get the local Gestapo tactics. When bankers and builders are involved, you get the wiretapping, undo traffic violation, tax evasion scam pulled on you. I personally had my homes monthy electric bill rated as a business, received a monthly bill of $5000. Dollars. Think this can’t happen to you…….think again. Mary, I am so very proud of you. I fought my fraud, I am still fighting the fraud. As a parent with children still in mandated school, I choose to let go of what I knew would ultimately hurt my children. This was not their battle, though with the fraudulent paperwork, milled by the now defunct Steven J. Baum law firm, you would have though they had sign some fictitious documents. I have dealt with the liers. I hope for all of our sakes, that this proving over and over again that this planned banking ponzi scheme, was and is perpetuated, through our own justices systems, on the American homeowners, has been and always will be FRAUD. I hope you have been freed. Nice write-up. Thank you. I spoke with Mary a few times since she was released on the gun charge, and this pretty much tracks what she has told me. I’d forgotten about Racicort being the governor’s son. and….. Where does this leave the millions of us that were defrauded?